We do not need to return to the primitive cabin to meet again a balance with the nature. The sophisticated technology of the major botanical covered garden of the world is a lesson of ecology and a bet for the use of the recycled materials. The Eden Project was born of the will to show how we can recover, and even manage to coexist, with the nature. To carry out this idea, his architect, the Britisher Nicholas Grimshaw, advanced in the investigation of extremely light structures with which to rescue a landscape desolated by the exploitation of a quarry. During the construction of the Project Eden, the study Grimshaw also developed a system of environmental management that was controlling the influence of his structures on aspects as the flora, the natural resources, the atmosphere or the local community. 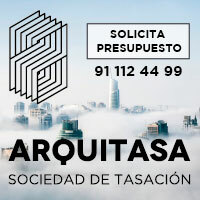 To this the credit owes come to being the first great study of architecture in to obtain the international ISO standard certified 14001, one that supports between his priority aims the protection of the environment and the prevention of pollution, in a balance sheet with the socio-economic needs. At present, the Grimshaw study has adopted as tool of design his own system of audit that, with the name EVE (Environmentally Viable Architecture), consists of an IT program that verifies the impact of a project in each of his stages of design and construction. His founder, Tim Smit, is a Dutch anthropologist, composer and musical producer, who reached popularity for his peculiar restoration of “Heligan Gardens” in Cornwall. These extraordinary Victorian gardens, which were showing exotic plants and horticultural innovative technologies, remained devastated in 1990, after the great storm that destroyed England. Smit’s achievement consisted of regenerating them promoting his self-sufficiency, for what they have managed, since then, to be the private gardens most visited of Great Britain. In 1996, Smit wanted to reach a major hearing to which to transmit the importance of the existing relation between the man and the plants. 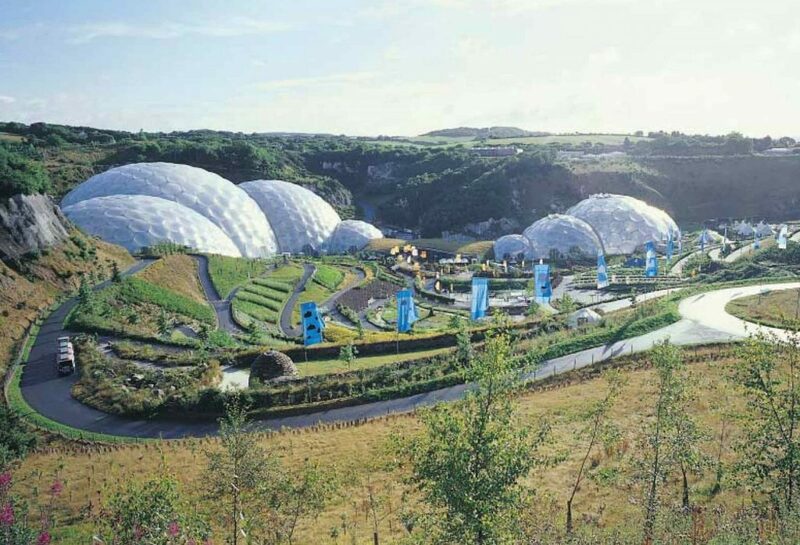 For it the Eden Project founded, an immense garden with thousands of plants of different climates. This one would be neither a conventional large-scale greenhouse, nor a theme park; his basic aim was of encouraging the visitors to learn to find a balance with the nature. In search of the suitable place, Smit found an area near to St Austell, in the peninsula of the extreme southwest of England that points at the hot waters of the Gulf Stream. It was a great quarry of clay, already in disuse, with a surface equivalent to 35 soccer fields and with a depth of 60 meters. Smit entrusted to Nicholas Grimshaw a structure that was it sufficiently high to shelter the trees of tropical forests and it sufficiently wide to give cover to the sunny Mediterranean landscapes. Due to the instability of the area and his hanging fort, Grimshaw proposed that the structures of the greenhouses it should rest lightly on the surface. As if they were treating each other about bubbles of soap containing a specific climate each of them, he projected a sequence of eight biospheres arranged in two chains, each one with four inserted vaults some in others. To construct the as ethereal as possible structures, there re-used the geodesic vault that the designer, inventor and environmental American Buckminster Fuller patented at the end of the fifties. The geodesic beginning consists of joining flat surfaces to form a curved form, allowing to cover more space without internal supports that any other closing, beside admitting enormous variations into the edges. Of this form, as the structure increases in size becomes proportionally more light and strong. 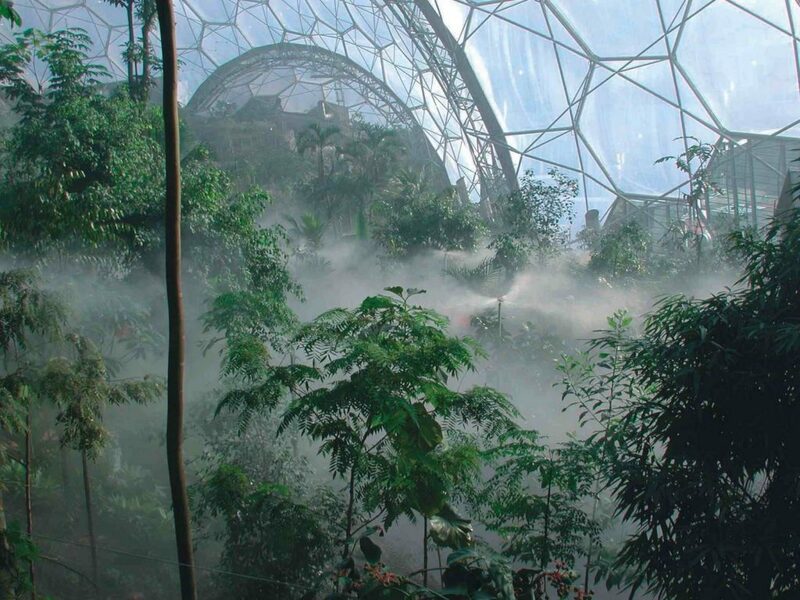 Based on this beginning, Nicholas Grimshaw designed two immense biomas, which cover 15.600 and 7.000 square meters respectively, to accommodate the Tropical Humid Greenhouse and that of Hot Zones. Every bioma is protected by vaults that are realized by tubular sections of steel galvanized, mounted and screwed as a giant meccano to form 625 hexagons. The set of the structure is constituted by a three-dimensional studding of two caps by spherical curvature interconnected, that include almost 4.000 unions and more than 11.000 bars, reaching the major one of the domes 200 meters of length, 100 meters of width and 55 of height. The enormous size of the hexagons, with vain of up to 11 meters, was making impossible the use of an alone glass to cover them. On having examined materials that were light, simultaneously that resistant, the architects verified that the sheet of etil-tetra-fluoridethylene (ETFE) had an ideal behavior. This industrial product, which is of common utilization in components of bombs, valves, chemical equipments and electrical mechanisms, is very transparent to the ultraviolet light, does not degenerate for the solar light and presents great capacity of thermal isolation with regard to the glass, beside being 10 times more light than he. The sheet, though it is vulnerable to the perforations, can be easily repaired by adhesive tape of the same material, is recyclable, is cleaned for yes alone and supports up to 400 times his own weight, that is to say, it manages to be the sufficiently resistant thing as to support the weight of a person. 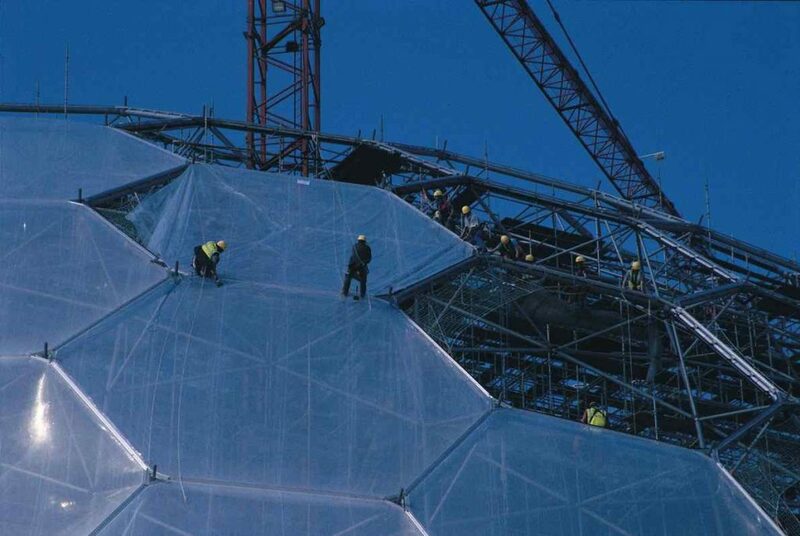 ETFE was undoubtedly some ideal to shape a few elements in the shape of ink pad that they were adjusting easily in the hexagons and were adapting to the geometric variations of the biomas without having to realize an exhaustive previous project. The sheet shapes a triple membrane which interior is kept swollen blowing air constant to low pressure by means of solar screens. Also there was born in mind the useful life of this material, which is 25 years, by a design that facilitates the simple change of panels as new technologies develop. Recovering the nature lost by the quarry, Grimshaw showed an extraordinary capacity of utilization of the Sol as principal source of energy to warm the biomas, and the water of rain to wet them. In addition it used recycled aluminium, wood proceeding from sustainable forests, the use of paper of newspaper to isolate térmicamente and stuffed great black-backed gulls of stainless steel with the local zahorra as walls of containment. All these are important materials in our raising awareness of the limited natural resources. Another mechanism of establishing direct relations with the company was the collaboration with companies that produce organic food, natural perfumes and those who promote the use of matter recyclable base in the industry.